How many times a day are you asked about directions for an assignment that you just explained? I know it is easy to get frustrated. This is a frequent topic in the teachers’ lounge, so take comfort that you are not the only one. I don’t think you can completely solve the problem, but I do think you can take steps to improve it. Like, any problem, you have to first get to the root of what is causing it. Sometimes there might be different things happening at once. If I am pressed for time, I have a tendency to rush through instructions. It should come as no surprise that when I rush, I get more questions. I have found a few things that helps me slow down and helps my students, too. I hold up one finger at a time when I give the steps of the directions. Example: I hold up 1 finger and say, “write your name at the top of the paper.” Students hold up one finger and repeat what I say. Then I hold up 2 fingers and say, “step 2 color the pictures before you cut them out.” The students hold up 2 fingers and repeat what I said. We continue with this format until all of the directions are given. For assignments that we do the same format each week, I make picture cards showing the steps so students have visual cues that they can refer to if needed. If you are not rushing your delivery and the majority of your class is asking questions, your students’ hearing may be affected by either allergies or a virus. If you’ve also had a high number of tattling, then your students are probably coming down with a virus. I have noticed a high rate of tattles 24-48 hours before they show signs of a virus. Did they have frequent ear infections during the toddler years? Children, who have chronic ear infections during the stage when they are learning to follow multi-step verbal directions, often do not learn to tune to the meaning of words. They are used to hearing sounds, but not the actual words because it is muffled when their ears are infected. With these students, you and the parent have to work with them like you would with a child in the toddler years. Start out giving one or two-step directions. Encourage them to look at you and repeat the directions so you know they are tuning in to the words. You will be surprised at how quickly they catch up to their peers. Is this an English as a Second Language issue? I have had students who had grandma for a babysitter the first 6 years. Grandma only spoke Spanish to the child and the parents only spoke English to the child. The home language survey said English was the language of the home, which was true. After meeting with parents and finding out the additional language, my student was able to get tested and needed support. Do you have a small group of students? Sit them in a group together so that you can go over the directions with the small group after you explained it to the whole group. 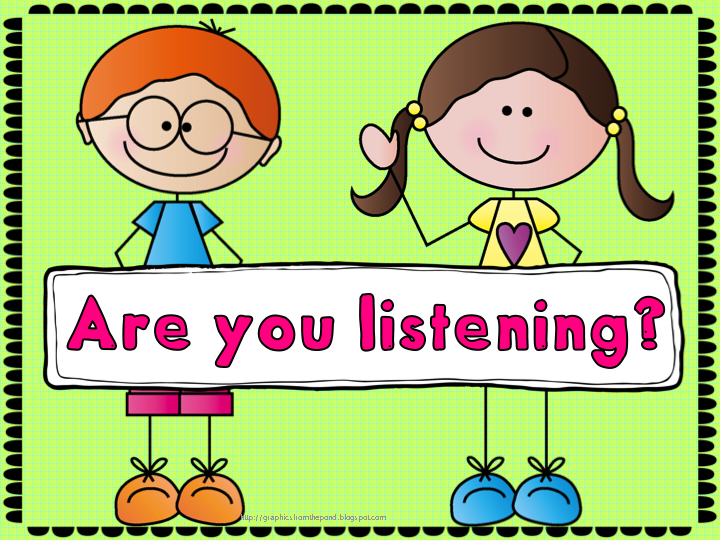 Listen and Draw is an activity that you can used with your entire class to improve listening comprehension. Students love Listen and Draw lessons because they are drawing and coloring. I have several FREE files that you can try here. Thank you for this post. I suspect that the possible reason for my son's listening problem could have begun in the toddler years. I know of other people dealing with children who had hearing problems such as this as well. This is beautiful. So full of truth! A "must pin." Yes, to answer your question, we have tricks up our sleeve also. We actually have a blues song for younger kids that's really funny (yet surprisingly sophisticated) called the Better Listening Blues. It helps students take themselves and others more lightly when they realize, oops!, wasn't listening again. Will try harder! As an ADHD personality, I have a lot of empathy for kids who have trouble sometimes absorbing all those words. We've just got so many thoughts of our own! Thank you ladies! I am glad this post was helpful. Michelle, I have been following your blog for awhile now, and I really enjoy the information you share, and the way it is presented. The art work and graphics you are using are phenomenal. I especially liked this post. I am going to share it with the teachers that I am currently working with. Thanks so much! Thank you Debra! I appreciate your kind words.